I know what you’re thinking… she forgot it’s Cinco de Mayo! I didn’t… Happy Cinco de Mayo! May your margarita glasses be filled to the brim and your enchiladas extra cheesey. Now, on to Thai food. Whenever I pose the question “What should I make?” on social media, a pad thai is always requested. When I first started the blog, I made a vegetarian pad thai. You can check that recipe out here. However, I’ve decided to revamp the old recipe – now, I’ve got a pad thai for you that’s even more flavorful and easier to make. That’s the beauty of blogging – you can always just improve old recipes and they become new! Who doesn’t love pad thai? It’s a pretty calorie-heavy meal due to the thick, yummy sauce, the peanuts and the noodles. 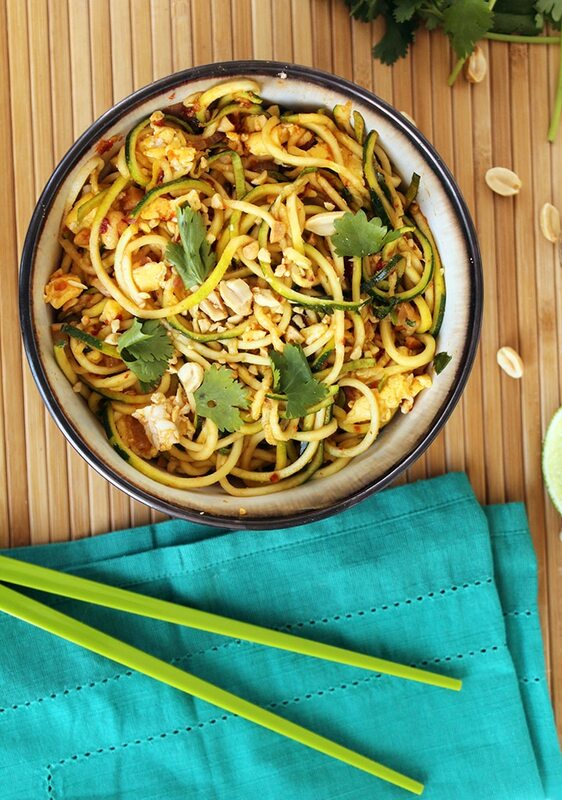 Luckily, we have the spiralizer to save us about 250 calories on the noodles! 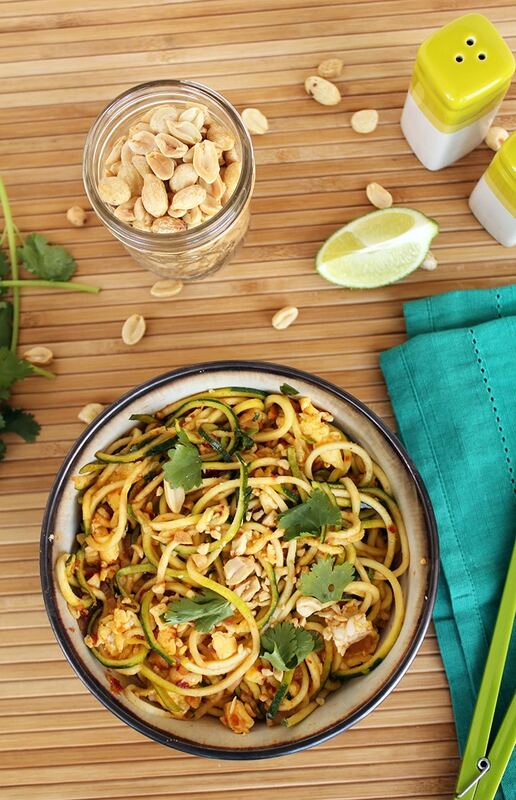 This vegetarian pad thai will totally satisfy your pad thai cravings. If you’re one who loves bean sprouts, add them in – I find them kind of soapy tasting, so I left them out. 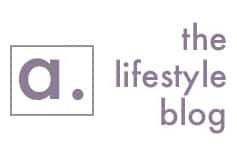 It’s my blog, after all! Pad thai is definitely everyone’s “gateway meal” into Thai food. It’s the equivalent of the California roll in sushi. Then, you’re hooked and before you know it, you’ve memorized every Japanese translation for all types of fish. When someone calls masago tobiko, you’ll chuckle. 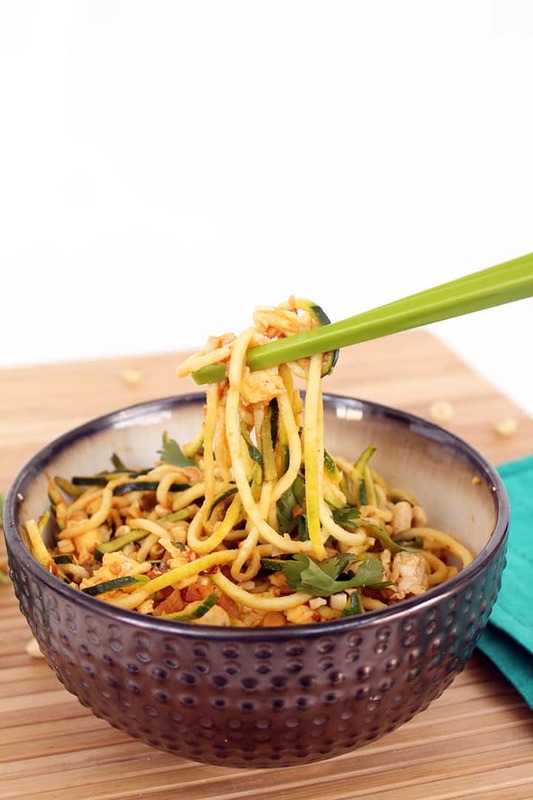 Zucchini noodles work perfectly in this pad thai, since they’re light and absorb the yummy flavors of the sauce. Honey is the perfect substitute for sugar here and gives the sauce its needed sweetness. Since the sauce isn’t too watery, you can easily store this in the refrigerator and have leftovers. Who doesn’t like cold pad thai? It’s almost better that way! If you want to add a bit more flavor, toss some shrimp in with the pad thai. It adds a natural flavor that compliments the fish sauce. To make a long story short, quit requesting pad thai! Juuust kidding. You know I love you all. 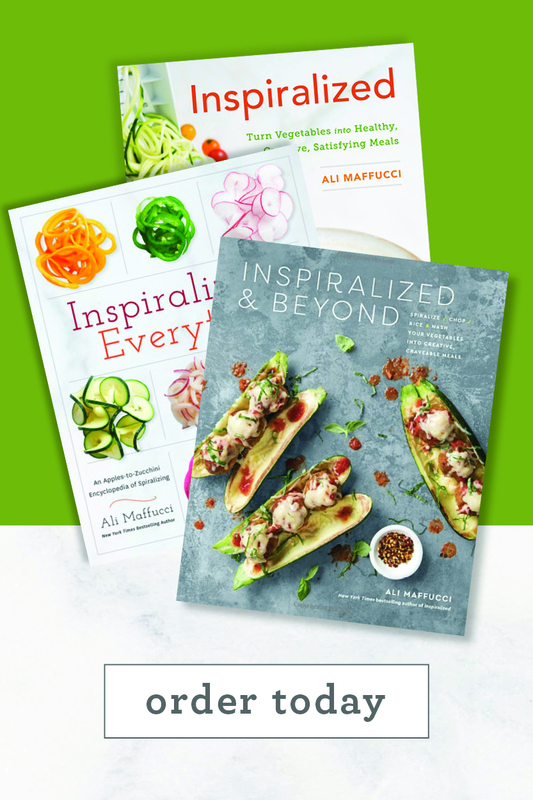 PS: Today’s the last day of the spiralizer giveaway – make sure you enter! Once you do, check your Inbox first thing in the morning, because I’ll be requesting your mailing address – I’ll need to send it right away so it arrives before Mother’s Day! The contest closes at 11:59pm EST on Monday, 5/5. What’s your favorite Thai noodle dish? Cook for about 2 minutes or until noodles soften and then add in the scrambled eggs and ground peanuts. Cook for about 30 seconds, tossing to fully combine. Fish sauce isn't vegetarian, as it is made from fish. This does look tasty, though. I was thinking the same thing. However, there are vegetarian versions of fish sauce available (like this one: http://www.shoptheeast.com/vegetarian-goods/1000-wan-ja-shan-vegetarian-mushroom-oyster-sauce-53-oz-074261040105.html). Or, you can always make your own vegan fish sauce by Googling a recipe. See the updated note in the ingredient list! Flour? Did I miss an ingredient? The instructions in step four state until flour dissolves but there is no flour in the ingrediants. How much flour is to be added? You mention dissolving the flour, however I see no mention of flour in the list of ingredients. Love to try it. How much flour? 88% DV of Sodium!! I'd suggest roasted unsalted peanuts; low sodium soy and low sodium fish sauce. I'm sure it'll still taste great. Is your allergy to nuts or just peanuts? I think pistachios would work fantastically in place of peanuts! 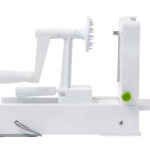 I just ordered my own spiralizer and expect it tomorrow! I am anticipating it's arrival so that I can use it and I know my mother would love one of her own to experience healthy eating right along with me! Glad to hear it - thanks Rosanne! Made this tonight! It's delicious! Thanks for the recipe -- I'll be making this a lot! I cannot wait to try this tonight with some shrimp and cashews (I don't have any peanuts) - this looks fab! We love Thai food and this pad thai is incredible! So glad I found your blog. This sounds super yummy! 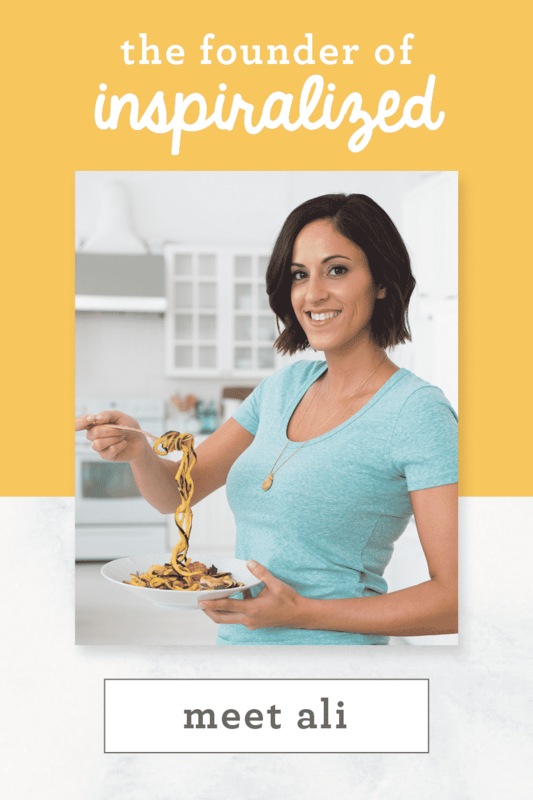 Just discovered your blog from Rachel Cooks' blog and I'm so glad I did...I have a brand new spiralizer I've been dying to try out, now I see tons of recipes, yay! Where do I get those chopsticks?!?! 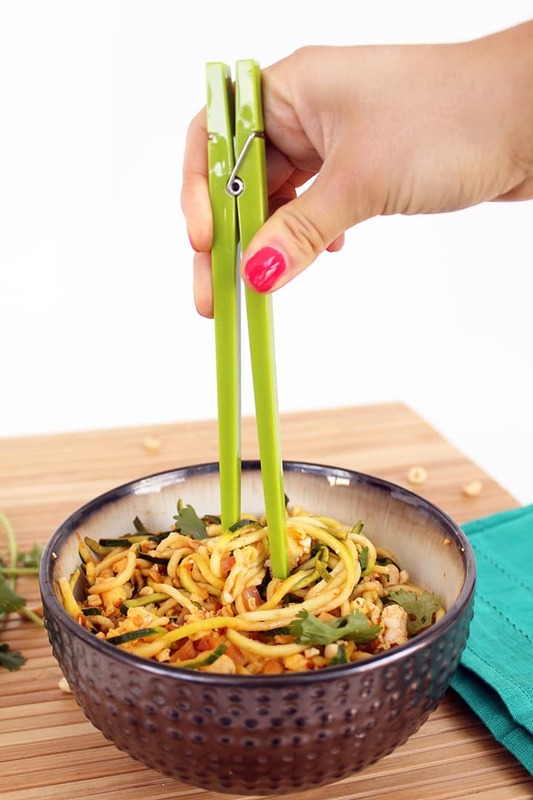 I'm already gonna try this, but I'd love the chopsticks! Coconut flour? Will regular flour work? This was SO GOOD. My fiancé and I just demolished it in about two minutes. Leftovers? HA. Maybe if I quadrupled the recipe..
What would be a substitute for coconut flour??? If you're not Paleo/gluten-free, you can use a regular flour. Or, arrowroot powder. Thank you! And thank you for making recipes for TWO!! This is stunningly good, and simple to make. Thank you, Alissandra. My spiralizer arrived this morning and this is the first dish I've tried. What a terrific start! Just made this and it was so delicious!! thanks so much! just one q - the noodles seemed to go quite soggy, is there something I could do to stop this from happening? I added the flour, but the second I added the zucchini my sauce became very watery, any suggestions? Sweat the noodles!!! If you sprinkle with salt, let sit for 15-30 minutes it helps swear out the water!!! It also softens them! We do raw vegan 80% and use that to give it a "cooked" consistency!! I made this with simple adjustments and it was fabulous. Hubby and I ate it up fast, probably too fast, lol! I used my spiralizer for the zucchini and a cucumber out of our garden. I mixed some natural peanut butter, the garlic chili sauce, maple syrup, soy sauce, a little sesame oil, and lime juice. Crushed a few almonds cuz that is what I had andserved it raw with some brown and wild rice. Yummy! Followed the recipe exactly and like someone else said, as soon as I added the zucchini noodles it basically became a soup :( even worse when I added the eggs. Was it supposed to scramble them separately before adding it to the noodles on the skillet? A bit confusing. It tastes good though. Yes, you are supposed to scramble the egg separately, as noted in the recipe (the first step)! I'm so sorry to hear it was soupy for you! Made the Pad Thai last night and it was YUMMY! It was my second Spiralizer dish (zucchini noodles with pesto being my first). I used Hoisin sauce, as one of my dinner guests is vegetarian. I also added bean sprouts because I can't get enough of them. I tripled the amounts of all the ingredients and only had a little left over. I had to make it in two batches because my pan couldn't fit all the zucchini noodles at once. I used whole wheat flour, as I didn't have coconut flour, which worked fine. All in all, I think it took me about an hour to make this. I would definitely make it again. Oh and mine was kind of liquidy--moisture from the zucchini & bean sprouts--but we liked it. It was like gravy as you get in other stir-fries. (Could have added some brown rice to it to soak it up...maybe next time). This was so yummy! I used hoisin sauce and siracha sauce as that is what I had at home. I can't hardly wait to make this again! I just made this again last night and it was just soooo good! I reduced the sauce, so it wasn't soupy at all. I didn't have peanuts this time, as it was a last minute dinner decision, so I used dry roasted almonds. Mmmm! 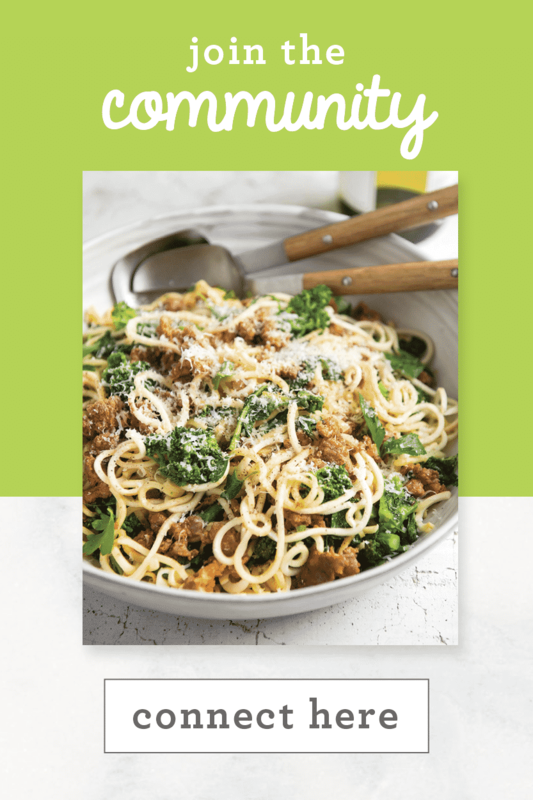 So happy to hear that you're making this recipe work for you! Yes, it will! The flavor won't be as yummy (the coconut flour adds that slight coconut taste), but it will work in terms of overall dish! I use whole wheat flour and it still tastes great! I see you have 2 recipes for pad thai - why two? do you prefer one better than the other?? The most recent one is the best version! I made this last night and it was tasty but way too sweet, which was disappointing. However, I just looked at the ingredients again and realized I added 1 Tablespoon of honey instead of 1 teaspoon. That explains it. I will try it again and do it right this time! I also used cashews instead of peanuts. Made this last night, with the Hoisin sauce. One of my new favorites!!!! Thanks again Ali! Spiriziled zucchini retains moisture. Try draining in a colander for 30 minutes before adding to other ingredients. Lara - thank you so much for your support! 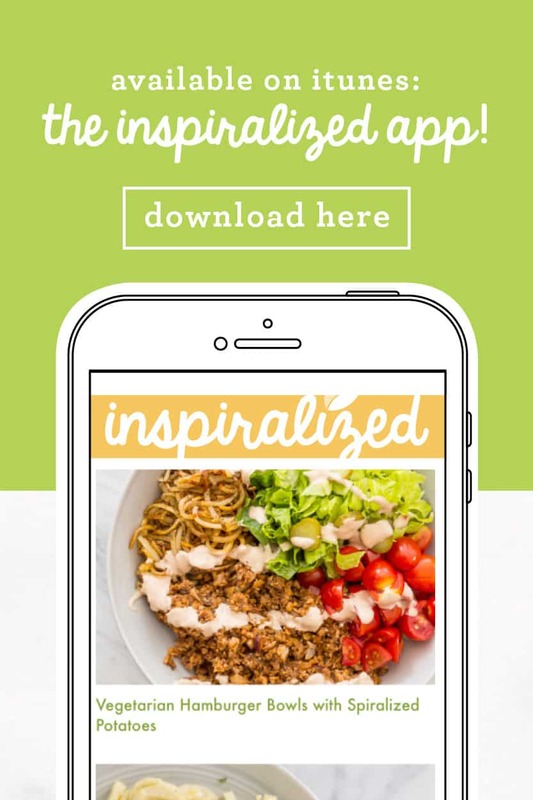 I'd love you to leave a review here for the Inspiralizer when you have a moment: www.inspiralized.com/product/the-inspiralizer! Those of us who eat fish but no mammals or birds are not vegetarian, we're pescatarian. really was hoping this would have turned out for me, sadly the zucchini waters down the sauce and I was left with soup . Recipe #2 since receiving my inspiralizer. Another win! My husband immediately asked for more but it was already gone. I will definitely double the recipe next time! And on a side note, I inspiralized an apple to include in each of my kids' lunchboxes and they really enjoyed eating "apple spaghetti" at school today. This is AWESOME to hear, Shannon. 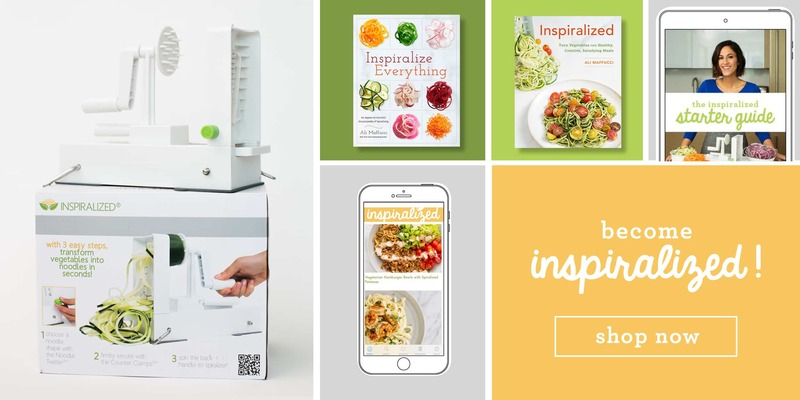 We're so happy you're enjoying the recipes and your Inspiralizer!! Keep us posted on what else you're making and what you're spiralizing for your kids!! Apple Spaghetti sounds like a total hit. Loved it! But I'm confused on WHEN TO ADD COCONUT FLOUR. The spiralizer in the photo above is not a Paderno brand. It's a knock-off. I know, I own both kinds. You can search on Amazon for Paderno and that one will come up, but it's like a Paderno, not the same. Go to a high-end bricks/mortar store like Sur le Table or Williams-Sonoma and ask to see a Paderno. Ummmm, are you serious? 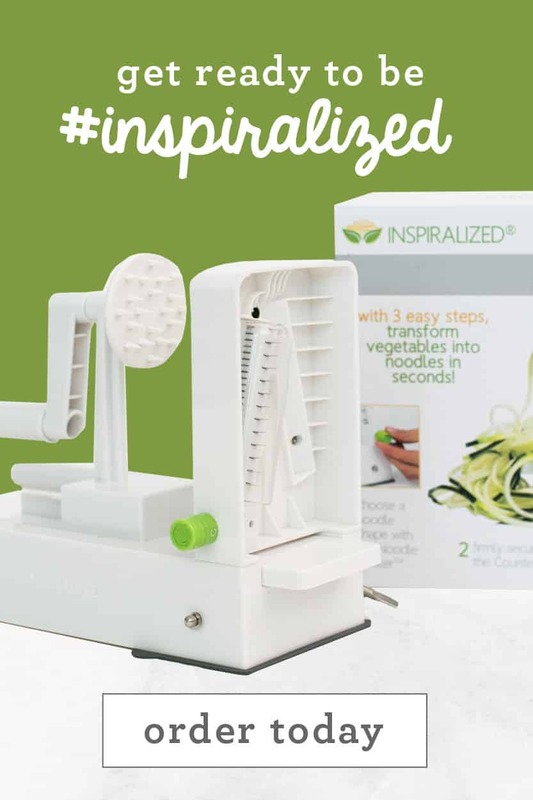 The "knock off" is the Inspiralizer, which is the best spiralizer out there. Do you even know what blog you are commenting on?? There isn't a person on here that would search Amazon for a Paderno. 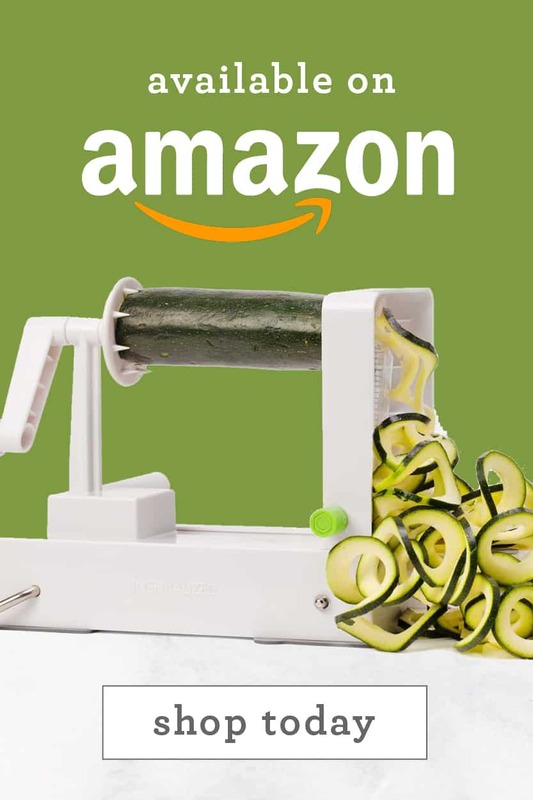 We have all gone on Amazon to order the Inspiralizer though. It's stupid to list fish sauce for a vegetarian recipe. Fish isn't a vegetable. It's stupid to preclude fish sauce just because it isn't a vegetable. I'm a vegetarian, but I'm not stupid about it - Pad Thai requires fish sauce, period - otherwise, it's not Pad Thai. I even (gasp!) reduce some anchovies to make zucchini noodle puttanesca, which is also delicious. So I'm no longer a vegan Eagle scout - although I consider myself one. I try to truly enjoy my food, within health bounds that are based on an actual medical requirement, not by zany limits prescribed by some intolerant zealot. Sheesh. Taste your food. Your organic zucchini was probably fertilized with animal-derived manure, worm castings, and fish meal. Get over it. I just want to say that this recipe is really good. My husband and I made it for supper a few weeks ago and it was fabulous and my husband keeps on telling people what I made for supper and we plan on making this again this weekend when we have some friends come over for a meal. This wonderful recipe will be in our rotation of meals. (I just discovered the Zoodler and loving it). We're so so happy to hear this!! This receipe is absolutely amazing! I was a bit sceptic about the different quantities first, but everything is exactly the right amounts and created a Pad Thai as good as from my favourite Thai restaurant. I couldn't even notice that there were no "real" noodles in there. This is going to be a firm favourite in our kitchen. And all that even though neither I nor my partner are huge fans of zucchini!! Hi, Ali. Just bought your new inspiralizer and enjoying it so far. We're making this recipe tonight, and since my wife is on weight watchers, we try to be very aware of the nutritional values of dishes. We've looked at this recipe a couple of different ways, and are having trouble with some of your numbers and thought that you might be able to enlighten us. The biggest difference that we're getting is in the carbohydrate/sugar area. We can't see what in the recipe could be bringing such a high value. Obviously, the honey seems to be the primary culprit, but that won't bring nearly what you are reflecting. Can you help us understand, please. Thanks. I was on Weight Watchers and it works great. It turned me onto a new way of thinking of food as fuel. Anyway I think the answer to your question is in the hoisin sauce. The bottle I have listed 20 grams of sugar for 2 tablespoons. Healthy luck to you. Recipe was awesome and easy to follow. Also added shrimp and baby bok choy to the mix. Made an amazing valentine's dinner for my girlfriend, thanks again! Do you think sweet potato noodles would work? What adjustments would you suggest? Hello! I am counting calories and the nutritional information says there are 2 servings of 308 calories in this recipe. But then the recipe says it is 1 serving? How many calories in the whole recipe as given, please? Yes, we always list calories per serving. We recommend only enjoying one serving if you're concerned - that will only be 308 calories! Yay! We love to hear that! Nice and simple! A must try item! 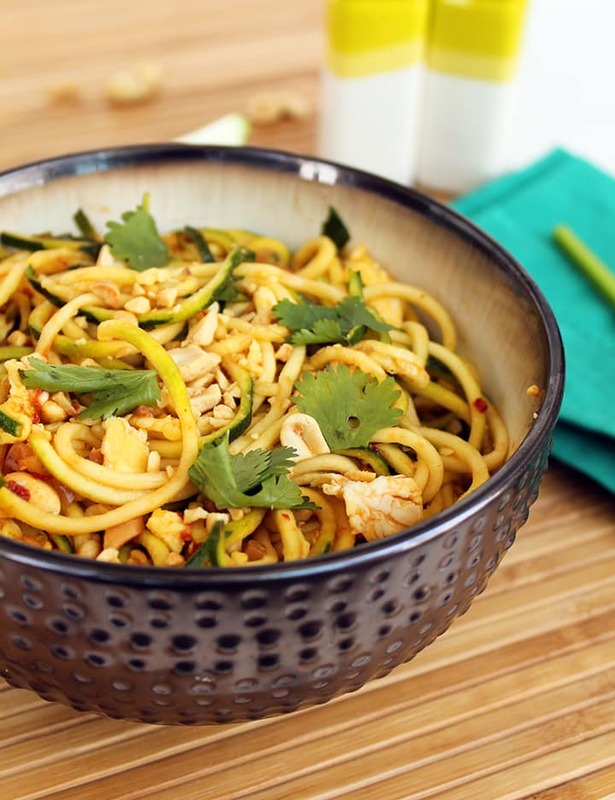 Thanks for finally talking about >Vegetarian Zucchini Noodle Pad Thai - Inspiralized <Liked it!